The new iPhone 8 and iPhone 8 Plus RED are already official , after Apple presented them without any event and without too much publicity. Although they have not yet reached the users on foot, they have already begun to proliferate the first unboxing of the device to be able to see closely the new design. Recall that the only change we can see with respect to the original iPhone 8 is just the new color. In the video that you can see right next, work of the well-known YouTuber Marques Brownlee , we can see the unpacking of the new iPhone 8 Plus (RED) , which has the same packaging as the original iPhone 8 , and with a single novelty, a small paper where the beneficial aspects of the series (PRODUCT) RED are explained. 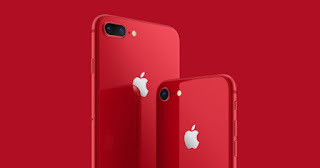 One of the most striking things about this new iPhone is its intense red color , which has nothing to do with the iPhone 7 and iPhone 7 Plus , which we could also see in red, although now they have disappeared from the market , and also with many other mobile devices that have reached the market in red. The new iPhone 8 Plus RED is much brighter than the RED iPhone of the past year , also creating a more than beautiful combination of black and red. Last year we must remember that the combination was white with red, which horrified more than one. After watching the video, I think we will all have the same feeling, and that is not another question because this beautiful design in red has not reached the iPhone X. I'm not sure if many or a few iPhone 8 and iPhone 8 Plus will be sold in red, but what I'm convinced is that they would have sold many units of an iPhone X (RED). What do you think about the design of the new iPhone 8 and iPhone 8 Plus (RED)?